CompEx Certification is an internationally recognised course and qualification in explosive atmospheres. It provides competency based assessment for personnel working in hazardous locations. Our courses consist of training and formal, practical and/or theoretical assessment. CompEx competency validation is most relevant and essential to people who are involved in the design, selection, installation, inspection and maintenance of equipment. Over 60,000 CompEx Core Competence Certificates have been issued to delegates world-wide making CompEx the World’s most widely accepted hazardous area competence qualification. 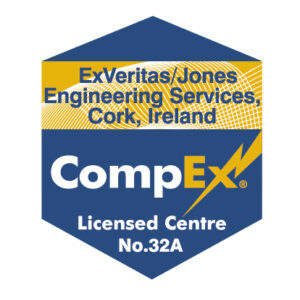 ExVeritas is a licenced CompEx Training Centre (licence number 32, 32a in Ireland and 32b in Malta) and also an ATEX Notified Body and IECEx Certification Body. We have over 200 years Ex experience within our company including specialist instructors in many areas such as area classification, explosion risk assesment or intrinsic safety, this means we can answer all of your questions, all of the time. Who Can Gain a CompEx Certification? Most courses (with the exception of the CompEx Foundation Module Ex F) require the delegates to fill in an application and meet a minimum entry requirement. please contact us for full details on eligibility. 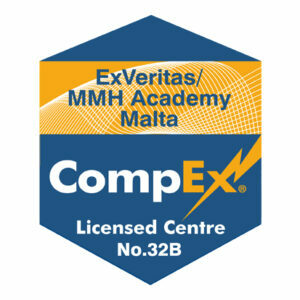 Why CompEx Certification at ExVeritas? The only training ExVeritas do is Hazardous Area Training – We are accredited experts in this field and as such have the leading instructors and facilities to ensure you will receive the very best instruction and assessment available anywhere. We are practitioners in Explosive Atmospheres installation, inspection and certification. We are an ATEX Notified Body and an IECEx Certification Body- We have well over 200 years experience in this field at our training centre and our four specialist CompEx instructors (we don’t bring in outside contractors to teach our courses, we only use our own staff who are industry experts and active practitioners with over 20 years experience each). In addition to presenting CompEx courses, we are on CompEx best practice working groups and help with the development of CompEx courses. We have real world experience in design, installation and inspection, in fact we have even written inspection software (www.iexinspection.com) and work with major blue chip companies providing area classification and inspection services. We are also members of L6/TC31 and active on many of the committee’s that ‘write’ the Standards such as 60079-14. We have a comfortable air-conditioned lecture room with HD projectors and audio and up-to-date practical facilities mirroring the requirements of the latest editions of the Standards. We offer hot and/or cold food at lunchtimes and complimentary hot drinks, snacks and Wi-Fi throughout your visit. Where possible, we can also demonstrate testing at our ATEX and IECEx UKAS Accredited test laboratory which is on site. CompEx is an internationally recognised qualification and is a prerequisite qualification for many plants and projects world-wide. (Please visit the CompEx scheme site for more details on the scheme which is UKAS accredited). CompEx are the largest recognised Ex training scheme worldwide, having issued over sixty thousand CompEx certificates. An increasing numbers of sites and projects required CompEx qualified staff for design. management and installation, particularly if you are working on other companies sites. If you only require training for your own site or to build your own custom equipment, other specialist courses may address your needs. Call ExVeritas for free, impartial advise on the type of training that would most benefit you or your organisation. 2018 Course dates: 19th & 20th February, 18th & 19th June, 13th & 14th August and 22nd & 23rd October. Circuit design (to component and circuit board level) with design exercises and practical examples and exercises, with free intrinsic safety analysis software. System design with barriers, apparatus and simple apparatus, installation and creation of DSD’s, with free intrinsic safety DSD software. Covering the design, test and assessment requirements for ‘Ex h’ Certification under ATEX and IECEx, with free Ex h mechanical design software.